For a good workout that's a lot of fun, aerobic dance steps are a good place to turn. While a traditional aerobics class might be boring for dancers, there are plenty of dance steps that constitute aerobic exercise; these steps get your heart rate up, which conditions your heart and lungs, not to mention burns calories and fat. In traditional aerobics classes, many of the steps are based on dance steps, but are simplified, with a lot of the artistry taken out of them. Technique is not as important in aerobics, whereas the first goal of dancing is to achieve the proper form and alignment. For dancers or just those who seek a challenge, true dance steps can be a lot more fun than many aerobics classes. Take for example the 'knee raise' in aerobics. Standing on two feet, you raise one leg into the air, simultaneously bringing your two arms down on either side of the knee that comes up towards your chest. Doing this movement repeatedly is a good aerobic workout if you do it fast and hard enough, but the move is very simple, and there is no 'proper form' to aspire to; the knee can be bent at several different angles, the knee can be raised to several different heights, and the arms can take several different positions. Contrast this with 'Chorus Line kicks,' where the knee should be perfectly straight, the toes pointed, and the foot should reach shoulder height, and it's clear which aerobic dance step is more of a challenge to execute. The following aerobic dance steps are true dance steps, and provide a fantastic aerobic workout. Be sure to stretch thoroughly before performing any of these steps. Standing with hands on your hips and feet together, make a small bounce jump, and as soon as both feet hit the floor again, raise your right leg straight into the air, with knee perfectly straight and toes pointed. When your right leg comes back to the floor, make another bounce jump with both feet coming back to the floor, immediately followed by the left leg kicking straight up. Repeat as many times as you can, with 64 being a good goal. For added balance and a good arm strengthener, stretch your arms out to your sides at shoulder height and simply hold them there. You'll need a large open area for this one and some varying speeds of music. To make a grapevine, step your right foot out to the side, cross your left foot in front, then step right side again and cross your left foot in back. Repeat continuously, and travel in a circle around a large room (the bigger the better). Start with a slower tune to get the hang of the step and the circle, and use faster music each day until you are basically running around the room. Try to stay on your toes for the duration of the exercise, and cross the grapevines smaller and tighter to keep up with the faster music. While doing barre exercises is generally not very aerobic, the ballet leaps and turns of center work become aerobic very quickly. Try out the following ballet steps in repetition, and by the end of the variation, you'll be gasping for breath. Cgaîné Turns: Traveling around the room, be sure to spot as you execute this chain of turns in a circle around a large room. Chassé: A very simple ballet step, chassés can be used to travel around an entire room, in circles. The wider your steps, the more of a workout you'll get. 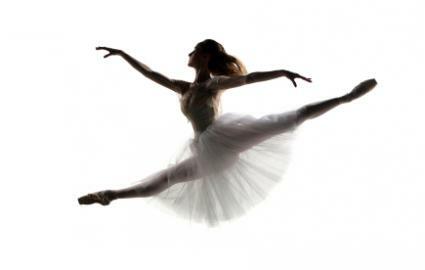 Grand Jeté: This classical 'split' leap is a joy to work on perfecting. In order to get into the leap, you'll have to take a few running (gracefully) steps before you take flight, making this both aerobic and fun to perfect. For tap dancers, wings are a lot of fun, although difficult to learn. Traditionally done only eight times in a row, repeating wings over and over again (aim for 50) is a fantastic workout. To execute wings, you will have to do simultaneous shuffles with both feet out to the sides. Start standing with feet together, and brush both feet out to the sides, then brush both feet inwards, landing with feet back together on the balls of your feet. The sound is 'shuffle-tap', with the landing on both balls of the feet being the 'tap' punctuation on the shuffles. When first learning, stand at the barre with both hands on the top rung for support; once you learn the step, wing your arms around in a wide circle on each step. All of these steps, and many more, can create a fun aerobic workout for dancers. Pick your favorite music and find a wide open space, and dance as though nobody is watching for a whole lot of fun, not to mention a great workout.